With the market action during the last few weeks, many investors have been operating in panic mode; subscribers to Robert Prechter's Elliott Wave Theorist haven't. Why? "as shown in this issue, time and price factors call for an immediate end to this dream state. When the alarm goes off and the dreamers awake, it will be pandemonium in the stock market. As the next few charts show, time and price have run out of room. Together, these time and price events seem finally to have cleared the way for a stunning decline in US stock prices." That's just a taste of what Bob predicted in this critical issue. You need to see the rest for yourself, and now you can. 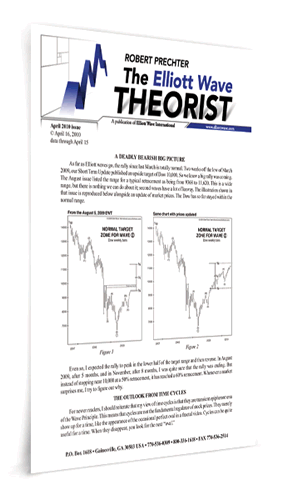 Our friends at EWI have given us permission to share Bob's FULL August issue of The Theorist. Free. Read all 10 pages and see all 15 charts! P.S. Don't delay. This free issue offer is only going to be available until Friday, Sept. 25 and then it's gone for good.